It was a year of big changes in the world of indoor lacrosse, internationally and locally. Start with the name of the league. The Major Indoor Lacrosse League was out, the National Lacrosse League was in. The NLL got away from the idea of the league owning all the teams and working out management contracts with local groups (like, in Buffalo's case, the Sabres organization). The NLL teams now had local owners, which in Buffalo's case were the Sabres' group. John Livsey, a former Sabres and Bills marketing executive, took over as commissioner, and expansion teams were placed in Hamilton, Ont., and Syracuse. When Boston asked for a season off to regroup, membership in the league was six teams with a 12-game schedule. That had a domino effect on the Bandits. Les Bartley had been associated with Buffalo right from the start of the franchise. He had the title of assistant coach in that first championship season of 1992, and then was promoted to head coach and eventually added two more championships. It seemed like a perfect marriage. But Bartley found it tough to turn down an invitation to come to Hamilton to run the Ontario Raiders. Bartley left with a career coaching record of 36-13 in Buffalo (or, 31-13, if you give the five wins of 1992 to Bob McCready). Les Wakeling was named as Bandits' head coach. He had been the head coach of two teams in the Ontario Lacrosse Association, where he won five straight Canadian Senior championships. "It all starts with hard work in your own end of the rink," said Wakeling. "I'm still a firm believer that your transition game revolves around defense. We're going to work harder at being a good defensive club." Wakeling did know the team's personnel; he had coached such players as John Tavares, Troy Cordingly, Rich and Travis Kilgour, and Tom Pfair. Marty Cooper was Wakeling's assistant coach as well as the team's general manager, while Ted Sawicki stayed on as an assistant coach for a third season. Wakeling kept the nucleus of his team more or less intact for the 1998 season. 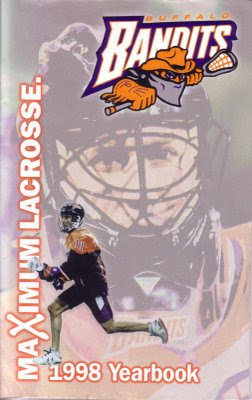 John Rosa was one of the few new faces; he had taken two years off after playing for the Bandits in 1995. Gone were 29-year-old Bill Callan, Neil Doddridge, 28, and Ted Dowling, 27. Rich Kilgour became the captain as replaced Brian Hall, who did not make the team. It didn't take long to figure out something wasn't quite right. Buffalo dropped a 14-12 decision to Philadelphia in the opener. "We got caught flat-footed time after time and didn't transition well at all to defense. We just have to work harder," Tavares said. Then, after a win against New York, the Bandits lost a 15-6 game to Rochester. It was the biggest loss and worst offensive output in team history. "They played harder than us, they were hungrier than us and they deserved to win this game the way they did," said Darris Kilgour, who had two goals and an assist. "A lot of our guys packed it in early. We can't be happy with this effort and we won't be." Losses followed to Philadelphia and Baltimore. Every loss was by at least five goals. A home overtime win over Rochester stopped the bleeding for a moment (Tavares had the goal), but the Bandits lost to Ontario and coach Bartley the next night. "It's a heck of a lot nicer being on this end of a close one," said Bartley, whose Raiders had lost three one-goal games this season. Buffalo beat New York the next week but lost to Baltimore at home a week later. That put the Bandits at 3-6 for the season and in serious trouble. "If we can win our last three games we'll be in the playoffs, it's that simple," Cordingley said. "We haven't found out yet what it takes to play consistently but I believe we can find it. But we'd better do it soon." The expansion teams allowed Buffalo to fatten up its record, just in the nick of time. The Bandits beat Ontario once and Syracuse twice to finish at 6-6. The last win clinched a playoff spot. "It was an emotional roller coaster," said Tavares, who had four goals and eight assists in game number 12. "It seemed like [Ontario and Rochester] were both winning for the longest time. There were times I was thinking maybe we wouldn't make the playoffs but we had to fight on." For the first time in team history, Tavares did not lead the team in scoring thanks in part to a knee injury that forced him to miss three and one-half games. Darris Kilgour had that distinction with a 67-point season, complete with 37 goals. "He had a great year when he was a rookie but there were times this year when Darris just carried this team," said Bandits captain Rich Kilgour, Darris' older brother. "He really showed just what kind of a team player he is." Tavares was second with 56 points, and both players were first-team all-league selections. Cordingley had 42 points in his first full season after suffering a severe injury in 1996. Pat O'Toole and Ross Cowie divided the goaltending chores, but neither was a clear number one until late in the season. O'Toole played 369 minutes and had a 4-3 record; Cowie played 322 minutes and was 1-3. O'Toole did see all of the work down the stretch, as he played in six straight games. The Bandits did earn a playoff spot, edging Ontario on a tiebreaker and getting a trip to Philadelphia to play the 9-3 Wings on April 18 in the bargain. The Wings were too good for Buffalo, taking a 17-12 decision. Darris Kilgour had four goals. The key moment came when the Wings scored five straight goals in the fourth quarter. "It seemed to me like it was only a few minutes, but that stretch of goals just buried us," said Wakeling. If having more 1998 losses than wins weren't enough of a problem, the Bandits showed some signs that their honeymoon with the fans of Western New York was coming to an end. The opener had drawn only 11,402, and the highwater mark in attendance came against Rochester on February 20 (14,230). Considering how Buffalo was now surrounded by rivals who were capable of attracting fans, it was easy to wonder if the league's expansion had damaged one of its flagship franchises. What's more, the team wasn't done sinking on the field.